Monthly income plans are popular and often opted for generating some sort of extra income. However there are ways in which your existing investment can be a monthly income plan. We have all heard about the monthly income plans, where a certain amount from our invested corpus is given back to us as an income. These can be either taken every month, or every 3 months, or 6 months depending on our needs. 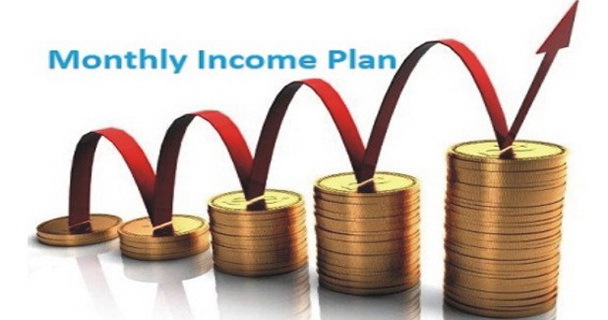 However, there are two things to understand before you gear up to opt for a monthly income plan, firstly to get any visible income every month you need to invest substantial amount of money in a plan and secondly the monthly income is not guaranteed as it is performance based. So how do you get a regular monthly income when you don’t have additional funds to invest or you need an assured amount every month? Your existing investments like a mutual fund can be your monthly income plan, let us see how. Mutual Funds are subject to market risks and we know that, so you may argue if a monthly income plan is performance based, then so is a mutual fund; so how does it give an assured return. Well it can. The thing to remember is it should be your existing mutual fund, ongoing for at least a year and then you can start your own customized monthly income plan. There is something called SWP, which is Systematic Withdrawal Plan, which allows you to systematically withdraw money at a regular interval from your mutual fund investments for a fixed period of time. So in simple words, if you have an existing mutual fund that has an accumulated corpus of say Rs. 60,000/- then you can start an SWP for Rs. 2,000 for a period of 30 months or 3,000 for 20 months and so on, till your corpus is nil. However, the thing with SWP is that while the corpus is 60,000 and you withdraw Rs. 2,000 in the first month, still you have Rs. 58,000 that has earning potential in the market. Yes it can go both ways if the markets do well it can earn extra, if they don’t then it will be go down. But by and large for most of the 30 month duration you are assured of getting 2,000 every month. Thus you are just channelizing your existing mutual fund to create monthly income. There is another way to prolong your SWP and thus extend your monthly income plan, that is if you can wait for a year and start an SIP or Systematic Investment Plan first. Let’s say you have Rs. 60,000 to invest. Now this same 60,000 you distribute over 20 months with SIP of 3,000 a month. After a year you would have invested Rs. 36,000. Now you can start with your SWP of 2,000 each month. While your SIP will continue for the next 8 months, your SWP will go on till the corpus reaches nil. The benefit you have in this approach is that you are ‘Averaging your Profit and Losses’ on the markets. You spend a fixed amount of 3000 to buy the units in Mutual Funds every month. If the markets are high, that same amount will purchase lesser units and when the markets are down they will purchase more units. This is how it is recommended; buy less when high and more when low. This way your returns are much more stable. Yet another way of rolling your money and prolonging your existing mutual fund to monthly income plan is by way of RD. In this approach if you have a corpus of money, whether through SIP or lump sum, you can in the first year start an SWP and invest that money in a Recurring Deposit Account for a year. So in this case too just like the above example of waiting for a year before you start an SWP, you wait for a year to use your SWP money. What this will do is your Rs. 2,000 will be transferred to an RD account every month and will earn additional interest and at the end of the year this will be 24,000 plus accumulated interest. Now in the following year you can start to use your Rs. 2,000 from SWP as income, and keep the Rs. 24,000 as rolling money for the RD for Rs. 2000 a month just like before. 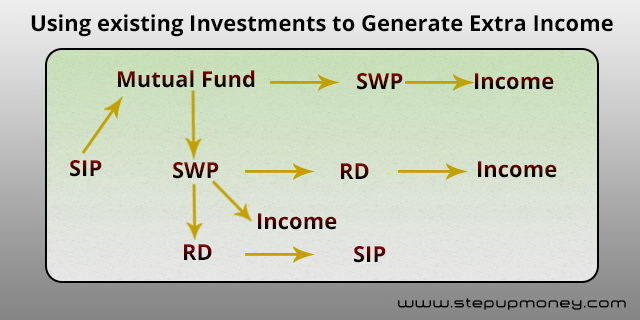 This way from one source, that it SWP from Mutual Fund you have generated an RD as well a Monthly Income. You are earning interest on RD too above your Rs. 2,000 SWP amount. The above approach can be used to further improve your investment portfolio. You start an SWP and then put that money through an RD like the above example. Now while you are using the money from SWP from the second year, your RD money of Rs. 24,000 can be used to fund another Balanced Mutual Fund through SIP of Rs. 1,000 each for a period of 24 months and further take the advantage of market returns. Since the investment duration is short term, opt for a balanced fund or a Debt fund. So your existing mutual fund not only generated your monthly income through SWP, it also got you an RD for a year on which you earned interest and then that accumulated corpus was further used to invest in a new or existing mutual fund with an SIP of 1,000 each. Basically you are investing only Rs. 60,000 and then diversifying that amount to further your investments and taking advantage of RD as well as Mutual Fund returns at the same time and still having that monthly income plan going. Similar approach can be used for starting any other investment instead of an SIP, it can be an FD, Debt Fund, Fixed Maturity Plan etc. Basically the idea is to channelize your existing income from SWP and RD to another investment. Investments can earn money for you, but your existing investments can also earn extra for you if you are smart enough with rolling your money. The only thing is you may have to wait for a while before you can get going, like in the above scenario you need to wait for one year for your money to accumulate, and then you can diversify that same money. Your existing investment can be monthly income plan and even more, so just think different and be smart about your money. You don’t need a bomb of money to really have multiple investments, just depends on how smart you are with getting your money rolling and letting your money earn money for you. PS: The durations for mutual funds in this post are from an illustration point of view. The longer you invest in Mutual Funds the better your returns will be. The idea of this post was to make you aware of the possible ways in which one investment can be used to roll into other investments be it mutual funds, interest earned from Bank FD etc, the above approach will help.